Like any great company, Trout Scapes River Restoration, LLC is about great people. Brian Cowden is one of those great people. Brian comes to Trout Scapes after being the V.P. of Sales & Marketing for a Montana based river restoration firm. Prior to that role, Brian worked at Trout Unlimited where he was on Eastern Conservation Staff for seven years as the Musconetcong Home Rivers Initiative Coordinator, working to restore and protect a major Wild & Scenic tributary to the Delaware River. 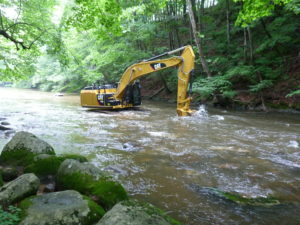 That work included restoring degraded river channels and banks on the mainstem and tributaries, removing obsolete dams, and working on critical lands protection for the “Musky” River in northwestern New Jersey. But Brian isn’t the only A Team player at Trout Scapes. Lance Bigelow received a B.S. in Agronomy-Plant Protection Option from Montana State University, Bozeman. He has more than twenty years of extensive knowledge dealing with both riparian and upland environments. During this time period, he has been involved with projects in Montana, Wyoming, Idaho, Colorado, Oregon, New Jersey, Connecticut, New Hampshire, Virginia, California, New York, Washington, and New Mexico. Lance specializes in the successful enhancement of rivers and streams by manipulating the natural streambed and incorporating restoration techniques and habitat enhancements that consistently improve the riparian ecosystem while also improving recreational opportunities. The third principal in this great company is Eric Werhand. Eric received his Fish and Wildlife Management degree from Montana State University in 2003. Within the past 12 years in the environmental consulting field he has participated in all phases of stream restoration, fishery enhancement, and pond construction projects. This experience has led to wide-ranging knowledge of project design, site surveying, permit acquisition, project budgeting, construction oversight, and site reclamation. These projects have encompassed a diversity of habitats from the freestone rivers of the Intermountain West to native Brook Trout rivers along the East Coast. Paired with a team of first-class equipment operators, Trout Scapes can do magic between the high water lines on any body of water. Their in-stream restoration improves sediment transportation and increases aquatic habitat for the benefit of all aquatic species. Pools are deepened to connect to groundwater, providing thermal relief and protection from predators. Riffles are created and enhanced to increase and diversify macro-invertebrate populations as well as to create spawning habitat. 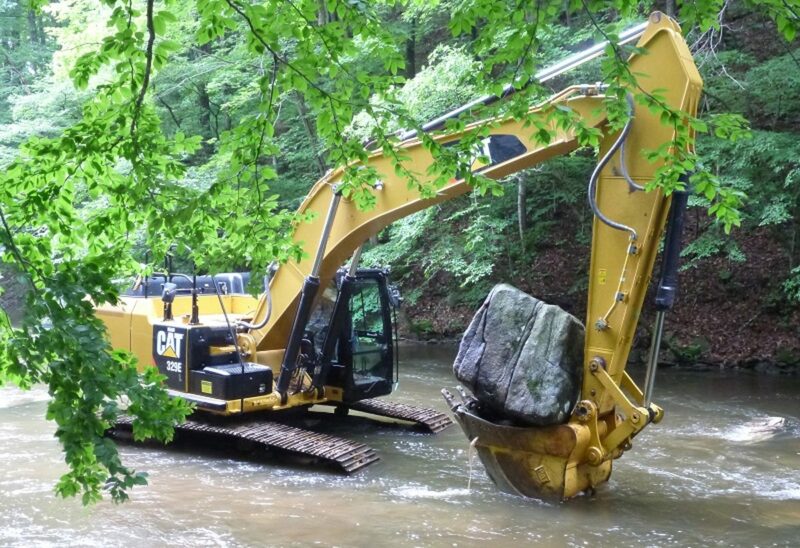 Woody debris and large boulders are added for habitat diversity to create prime lies for trout. Banks are restored as necessary, and they work closely with clients to plant native vegetation to further provide shade and cover while the roots help hold banks stable. Of utmost importance, they reconnect the river to its floodplain wherever possible. But it’s not just about the technical aspects, it’s about something deeper. It’s all about passion. Passion is what drives Trout Scapes River Restoration LLC in everything they do. Whether restoring or enhancing a trout river or designing and building a pond, passion drives their thinking. 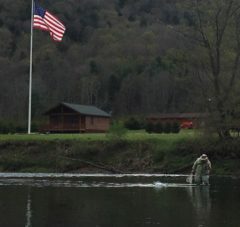 The passion shines through on every project for Trout Scapes. It isn’t just a job, it’s a mission. And it’s a mission that dovetails perfectly with the mission of Trout Unlimited. That’s why we’re proud to have Trout Scapes River Restoration, LLC as a TU Business member. Trout Scapes is proud to be a Trout Unlimited Business!